Singapore hotels. - Hotel videos, user reviews, cheap booking! Showing 1 - 10 of 341 best hotels. | Sorted by rating. Fullerton Bay Hotel Singapore offers luxurious accommodations a 10-minute walk from Raffles Place MRT Station. Offering free Wi-Fi and free parking, it has a rooftop landscaped pool and rooftop bar. On the bustling Geylang Road, the Joyfor Backpackers' Hostel is conveniently located within 320 yards of Kallang MRT (rapid transit) Station. The Forest by Wangz is a 15-minute walk from Novena MRT Station. The residence provides a free shuttle to Outram MRT Station, Suntec City and the popular Wisma Atria. The AMOY by Far East Hospitality is a beautiful boutique hotel in Singapore, just a quarter mile from the Chinatown MRT (subway) Station. 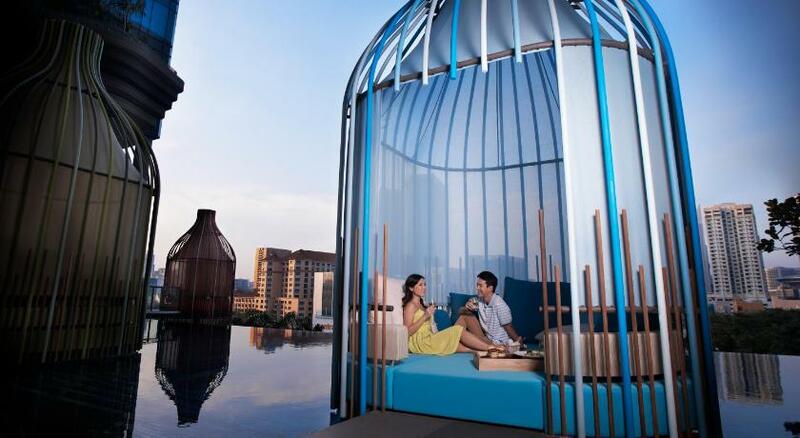 The 5-star Pan Pacific Singapore provides direct access to Marina Square Mall and Suntec Convention Centre. In the central business district, The Fullerton Hotel Singapore is a 5 minute drive from Clarke Quay and Boat Quay. It features a spa, infinity pool and 24-hour fitness center. Excellent service starts even before your stay, with personal assistants contacting guests to ensure smooth arrival at Capella Hotel, Singapore. Pan Pacific Serviced Suites Orchard is luxurious 5-star accommodations conveniently located next to Somerset MRT Station. Comfort and design were taken into consideration at the Adler Hostel, a premium hostel which opened in 2012.